What U.S. City Has Highest Marijuana Positivity Rate in Drug Tests? The Answer Will Surprise You. 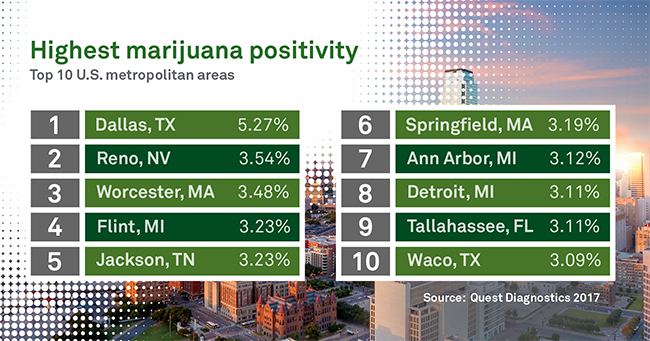 States with the highest marijuana positivity rates in employment drug tests do not necessarily contain the cities with the highest marijuana positivity rates, and a city where marijuana is not even legalized for medical or recreational use surprisingly led all cities in marijuana positivity rates, according to data from Quest Diagnostics. Marijuana positivity for the American workforce is up for the fifth consecutive year – a trend that shows no signs of slowing – and drug positivity in states without marijuana use statutes has kept pace with the national average of 2.1 percent for the U.S. workforce. To learn more, visit www.dtidrugmap.com. As of 2018, 33 states and the District of Columbia have approved medical marijuana programs, according to the National Conference of State Legislatures (NCLS). 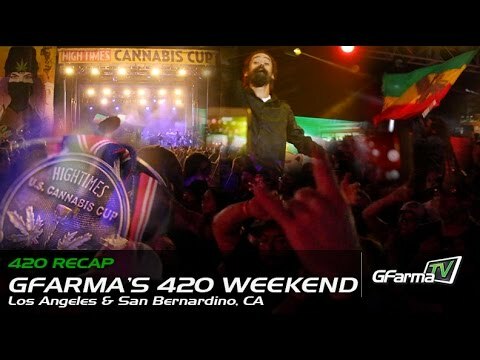 Some states have also passed laws allowing recreational use of marijuana by adults, even though marijuana is still illegal under federal law. For employers that are mandated to do drug testing or choose to drug test, the national trend towards legalization of marijuana for medicinal and recreational purposes will be a critical workplace issue that will require attention, especially given state marijuana laws can conflict with federal marijuana laws.